Part 2 is up now. We talk about Portal 2 puzzle design, inspirations behind the underground chapters, and certainly nothing about HL3. I talk more in this part than the other part because I'm trying to figure out why Adam Foster's work is so good -- is it because his floorplans are so 3D and holistic? Is it his bold use of symmetry in places? Someplace Else has a structure you don't see in-game: the alien complex has a spine, ribcage, and even some kind of pelvis with vestigial legs. I thought Half-Life 1's r_speeds were keeping him from linking all the areas and making this structure more apparent, but after the interview, I think it's more that he likes keeping some secrets to himself. And to "justAModsLover": I totally forgot about the Someplace Else port, and I'm going to make that my winter project. 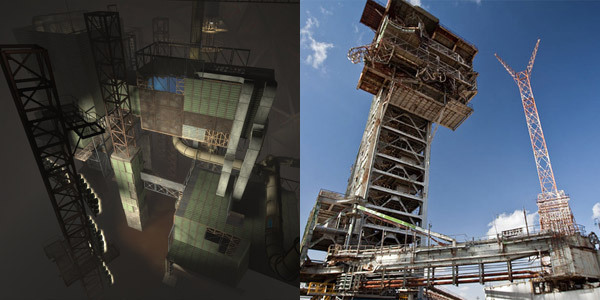 I hope people notice my image curation cleverness re: putting a screenshot of his older HL1 mod Parallax with a giant funicular cargo lift next to a more recent screenshot from Nightwatch with a giant funicular cargo lift. Gotta love the hazard stripe trims. In both levels, these were pretty big epic setpieces and more or less define how the rest of the level is structured. 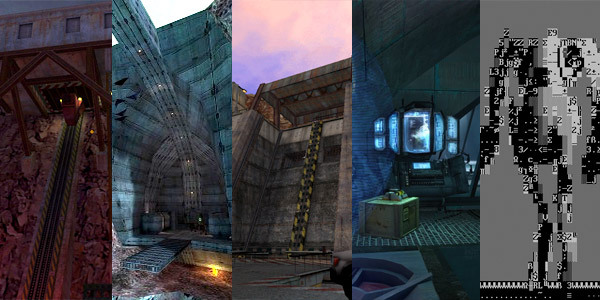 The best part is that they all contradict the original funicular setpiece from HL1, the slow headcraby-descent in the middle of Unforeseen Consequences -- there are no monsters suddenly spawning in either of Foster's versions (if I remember correctly in Parallax?) so you just enjoy the ride and scenery, though you're probably on edge the entire time. If you're an Adam Foster fan, I do encourage you to check-out Parallax. It's so old and a bit buggy, but the structure still feels pretty modern. Triple Jam Pile-up this weekend!